A website is a cluster of a number of web pages. A user would love to stay on your site if it allows easy navigation in different pages. Breadcrumbs help in doing this task. Breadcrumbs are web design components that give a back path for users thus simplifying the navigation on the complicated websites. In simple words, breadcrumbs play an important role in reducing the number of tasks that a user needs to perform to get to a higher level of your website. It is also an effective visual aid that indicates the location of the user within the hierarchy of the website. Apart from providing a good user experience it also helps search engines like Google to better index your website thus providing an ordered sense to your website structure. This helps in improving the internal linking structure. So breadcrumbs are defined as a type of secondary navigation scheme that reveals the user's location on a website. It helps the user in tracing their path back to their original landing point. It is useful for the website that has an amount of organized content arranged in an ordered way. Breadcrumbs are found in web applications that have more than one step. In such a website, it functions as a progress bar. It is represented as horizontally arranged text links that separated by greater than symbol (>). This symbol is used to indicate the level of the page that is related to the page that is linked beside it. What Make Breadcrumbs So Important? Since the breadcrumbs are used as a secondary navigation tool, it serves the purpose of web design services that help to return their earlier segment of the website easily. Thus, it makes your website user-friendly. Introducing this factor into your web design component puts a positive influence on many e-commerce websites and other sites that have a number of pages to navigate. This results in better user experience hence more conversion rates and sales. It also increases the web crawling and page indexing which makes easy visualization of important keywords. Thus it helps in improving SEO and page ranking on search engine. Effective in Completing Tasks: The scheme offers effective task completion, efficient speed and easy way to reach the goals of the website. Many users visiting your website like to use the breadcrumbs located below the main page title to find their present location in the page hierarchy. Convenient for the users: The links of the breadcrumbs help the users to perform their task even though they visited your website for the first time. This makes it convenient for the users to use your website and reduces the chance of skipping their places on a large scale website or web portal. Helps in Finding Content: It is the best way for the users to search within connections in the breadcrumbs path. It makes easy for them to directly jump to any division or product without getting lost within. Reduces Bounce Rate: Navigating a website using breadcrumbs classify navigating a website more accurately. This makes your website more alluring and invites more and more users to clicks on higher level pages to view topics of their interest. This helps in reducing the bouncing rate of the website. 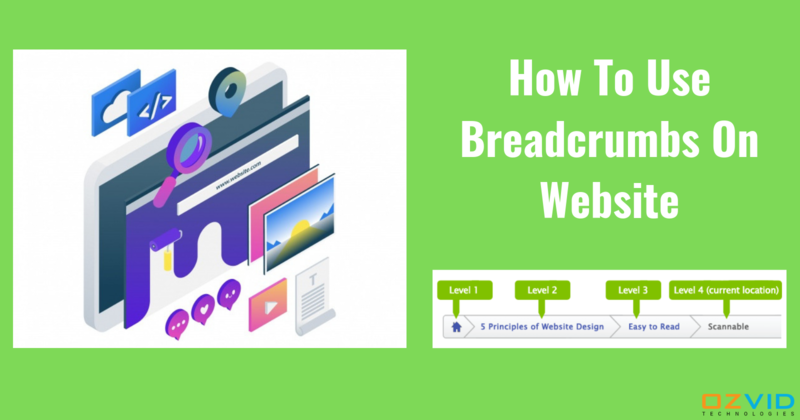 So now you are aware of the importance of breadcrumbs for your website, it is now time to introduce it to your website. Doing this one simple thing will enhance the usability of the website thus improving your website ranking and hence sales. If you want to add the feature in your website, you must consult the team of website designers and developers of OZVID. We offer you the best website services that help your business to acquire targeted goals.